These amazingly colourful and sensual felt magnets spread vitality all around. Each of those colour bursts has been carefully felted by hand. Even the little glass pearls were sewn on by hand. Of course, each ball contains a strong super magnet; that makes them not only pretty but also useful. The colourful balls are handmade in Switzerland and make for a perfect gift for those who like to brighten up their everyday life. 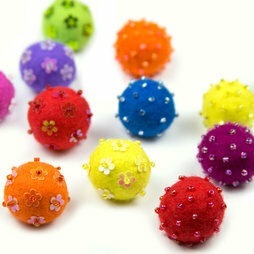 The felt spheres with flowers and glass pearls were created and produced in the Transit studio in Wil in Switzerland. Transit is a program for employment seekers. The goal is the reintegration in the job market. Each felt sphere has a diameter of approx. 25 mm. A rod magnet is pressed and glued into the felt sphere. Here, the wool for the felt spheres is prepared. The center of each sphere is a cotton ball that makes sure the felt sphere keeps its shape. With hot soap water and lots of patience and handiwork, the wool turns into felt. The decoration is sewed on by hand. A stud hole is punched and a rod magnet is glued into. The soft and handy magnets bring joyful colour specks into the daily routine. The colourful felt spheres effectively beautify your magnetic board.